Altogether, the DNA sequencing revealed 80 genera of fungi on the surface of our bodies. Fungi belonging to the genus Malassezia are by far the most common on the head and trunk. The hands, which are rich in bacteria, have relatively few types of fungi. But it’s the feet—the heels, the webbed skin between the toes, and the toenails—that harbor the most diverse collection of fungi, with up to 80 genera—including the yeast Saccharomyces that’s used to brew beer and make bread. Toenail infections are notoriously difficult to eradicate. Interestingly, the researchers discovered that toenails foster unique collections of fungi. Some of these fungi can discolor and break the toenail, creating portals through which other pathogenic bacteria and fungi can enter the body. Human Skin Fungal Diversity. The fungi Malassezia (purple) dominates the majority of the body sites. The feet harbor the greatest diversity of fungi. 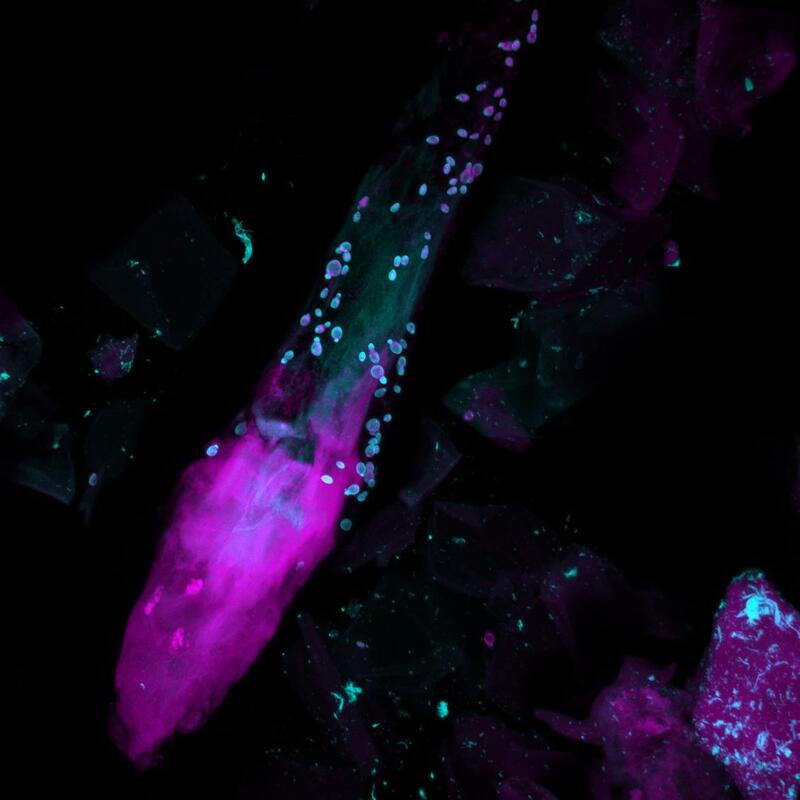 Credit: Darryl Leja and Julia Fekecs, National Human Genome Research Institute, NIH. Together, all of these studies reveal that the skin is an incredibly dynamic and complex ecosystem teeming with bacteria, viruses, and fungi that interact with each other and with us, their hosts! This census gives us the opportunity to investigate how all these microorganisms network, what they do for us, and what we do for them. That’s vital, because certain microbes are needed for healthy skin, while others cause disease or set the stage for them. The skin isn’t the only location that harbors fungi. Just last year, an NIH-supported team based at Cedars-Sinai Medical Center, Los Angeles, showed that there’s a rich community of fungi co-existing with bacteria in the human intestine . About 29 million Americans suffer from fungal infections. Many of those are just bothersome skin problems—but fungi can also cause life threatening lung problems (like Valley Fever in the Southwest United States) or meningitis (as recently reported in hundreds of individuals after epidural injections of a contaminated steroid preparation). Most current oral antifungal medications have serious side effects, including liver and kidney damage. To develop safer drugs and vaccines, we need a better understanding of our fungal friends and foes. The use of genomic sequencing to take the census of these microbes opens a new chapter in understanding health and disease. 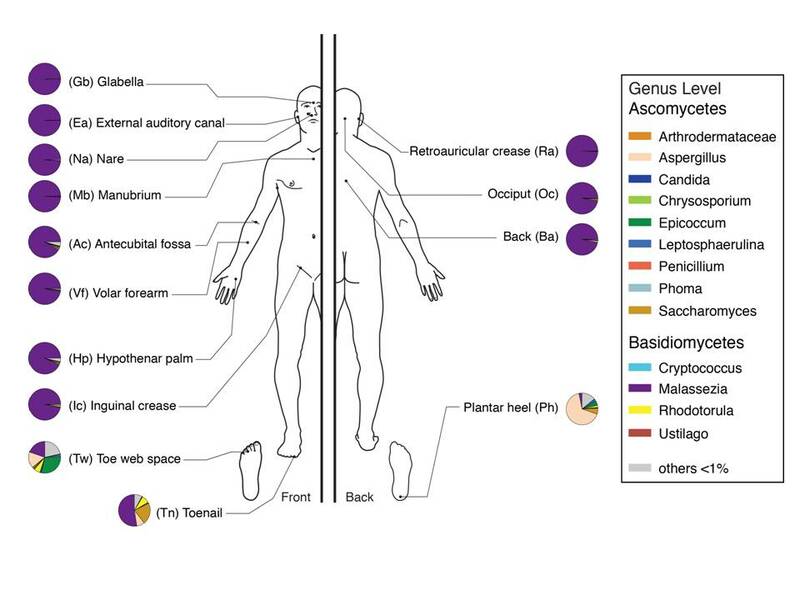 Topographic diversity of fungal and bacterial communities in human skin. Findley K, Oh J, Yang J, Conlan S, Deming C, Meyer JA, Schoenfeld D, Nomicos E, Park M; NIH Intramural Sequencing Center Comparative Sequencing Program, Becker J, Benjamin B, Blakesley R, Bouffard G, Brooks S, Coleman H, Dekhtyar M, Gregory M, Guan X, Gupta J, Han J, Hargrove A, Ho SL, Johnson T, Legaspi R, Lovett S, Maduro Q, Masiello C, Maskeri B, McDowell J, Montemayor C, Mullikin J, Park M, Riebow N, Schandler K, Schmidt B, Sison C, Stantripop M, Thomas J, Thomas P, Vemulapalli M, Young A, Kong HH, Segre JA. Nature. 2013 May 22. Topographical and temporal diversity of the human skin microbiome. Grice EA, Kong HH, Conlan S, Deming CB, Davis J, Young AC; NISC Comparative Sequencing Program, Bouffard GG, Blakesley RW, Murray PR, Green ED, Turner ML, Segre JA. Science. 2009 May 29;324(5931):1190-2. Interactions between commensal fungi and the C-type lectin receptor Dectin-1 influence colitis. Iliev ID, Funari VA, Taylor KD, Nguyen Q, Reyes CN, Strom SP, Brown J, Becker CA, Fleshner PR, Dubinsky M, Rotter JI, Wang HL, McGovern DP, Brown GD, Underhill DM. Science. 2012 Jun 8;336(6086):1314-7. This article does a great job explaining this facinating issue but does little to discuss how we may prevent ourselves (prevent is probably a bad term, limit ourselves would fit better) from harmful fungal exposure. Wear sandals more often? Bathe more frequently? I wonder if there is anything we can really do to limit our exposure? Thank you for your interest in our research and for your questions. Our study examined what fungi were present on the skin of healthy volunteers and does not directly address these questions. Much information about fungi including the definition of ‘beneficial’ versus ‘harmful’ fungi remains unknown. At this time, it is too early to know if limiting exposure is helpful or actually harmful. Further research is needed to understand the function of these skin fungi and how these fungi may be beneficial for human health. I am an artist … I am also a would-be scientist as a hobby. … Do you think you could use a way to communicate with the fungi, use mental telepathy or some other way to find something that could excite them to communicate. It is like praying over a plant to get it to let you know you care about it and it grows more profusely…. The skin being a living organism reacts to different environments (such as humid, hot, dry or wet climate conditions). Did the research indicate which locations fungi may be expected in certain types of environments?